The developers behind the blockbuster game Cut the Rope promised their next potential hit will hit the application shops today, and here it is, Pudding Monsters is live for iOS. The Android versions is taking its sweet time, but it should appear later today, too. 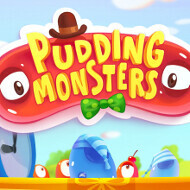 Pudding Monsters is a funny puzzle game where you need to save your pudding monster friend from the fridge owner. Swiping sticks monsters together, eventually becoming the Ultra Mega Monster. And, monsters will have different special powers, like leaving trails of goo to add "unique twists and turns in gameplay". Have a peek at the official Pudding Monsters trailer below, or, if you own an iPhone or iPad, head to the source link below for some pure sticky $0.99 fun.